Roy Wood Transits in Berkshire has enjoyed a 45-year association with Ford’s iconic range of vans, which celebrated its 50th anniversary in 2015. And its latest campervan conversion, the Auto Campers Day Van, is every bit as adaptable as the vehicle on which it is based. Featuring modular furniture that can be reconfigured on the fly by the user, the Day Van is both super-capable daily drive and genuine multi-purpose camper. Campers with modular furniture are no strangers to the market, of course, but what makes the Day Van stand out is its Ford Transit Custom underpinnings, or more accurately the Ford Tourneo Custom, the people-carrier version of the Transit. Regular readers will know we’re big fans of this base vehicle. It’s great to drive – more car than commercial vehicle, with an ergonomic and comfortable cabin – but perhaps best of all, it’s very well equipped for the money and the factory-fitted options retail for real-world prices. This results in a campervan that’s affordable for more potential buyers, and we think there’s much to applaud about that. Auto-Campers also offers a Leisure Van, which sports a fixed rear kitchen and storage unit along both sides of the vehicle. The Day Van reviewed here is a different beast, though, and can be configured from the floor up by the buyer. Six rear travel seats can be specified, formed from a single and double seat, in two rows, making eight in total. These seats can then be detached from their factory-fitted floor mounts and removed to create a large luggage space – or you can rearrange them into the layout on test here. This configuration sees two single seats sited behind the front seats, and one of the double seats behind them, to make a total of six belted seats. The space saved is used to deploy a kitchen unit and storage units along the offside wall, so the Day Van now follows the classic campervan layout. These modular units are self-contained and secure via bolts to the floor, so they’ll be perfectly robust and safe during transit. Our test ’van, based on the 2.2-litre Ford Tourneo Custom, sported Trend trim with a 125ps engine and an elevating roof to increase the interior standing height (low-line and high-line roof heights are also available). There are sliding doors on both sides, plus a tailgate, to permit easy loading and to bring the indoors outdoors. The vehicle has a pleasing design, with contemporary styling cues including swept-back light clusters. A lounge is formed in the row behind the driver, by adding an occasional table to a receiver in the floor. Swivelling front seats, a cost option fitted to our test ’van, helped make the most of this area, which, with the side doors opened, is certainly an agreeable place to be. You buy the kitchen as an extra module for 1800 and it has metallic black worktops (not the grey shown in our test 'van) and an exterior flip-shelf. The camping stove fits neatly in one drawer for travel, while the compressor fridge fits in the drawer below. Next to it is a tambour door hiding the fresh and waste water tanks. Below that is the Porta Potti! It's an impressively compact arrangement. The optional roof bed was also fitted, making four berths in total. The roof bed is 2m x 1.2m. The lower double bed measures 1.84m x 1.16m and its configuration depends on which storage units are fitted to the offside; choose between a transverse or longitudinal orientation. As with most campervans, there is no washroom, although you can always wash in the sink and use a Porta Potti in the privacy of the 'van. The campervan's rear door opens up to give excellent access to the generous under-bed storage area, which is where you'll probably want to put kit bags, bedding etc during the day. Specify some choice added extras, though, and the Day Van’s capabilities go well beyond the limitations of its name. Our well-specced version included a driver’s swivelling seat (£400), roof bed and lights (£500), primary bed system (£800), longitudinal bed extension (£200), kitchen module including exterior shelf (£1800), lower utility unit with tambour doors (£800), top utility unit with tambour doors (£800), Dometic toilet (£100) and Webasto heating (£1000). A suite of extras like this makes the Day Van viable for more than a long weekend at a festival, and it was easily up for the job of pootling around Suffolk for Practical Motorhome's October 2015 edition. Other extras fitted to our test vehicle included alloy wheels (£600), colour-coded body details (£600), 240V hook-up and charger (£400), tailgate bike rack and struts (£300), 2.6m cassette awning (£500) and multi-rail for awning fixture (£200). 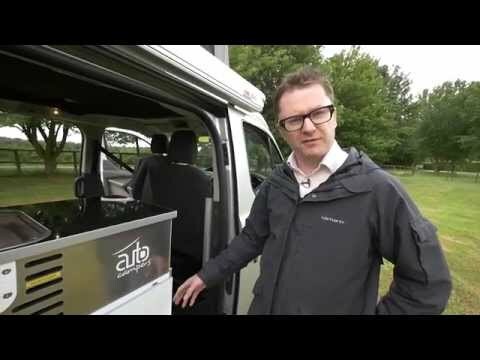 Fun, flexible and futureproof, the Auto Campers Day Van is much more than its name suggests. You get a superb base vehicle and conversion for well under £40,000 – even with some must-have options added – and the modular furniture means you’re not tied to one layout. This is a genuine go-anywhere campervan as well as a fabulous daily drive.